The March 30, 2018, launch marked the fifth flight this year for the Falcon 9 and its 51st flight overall. 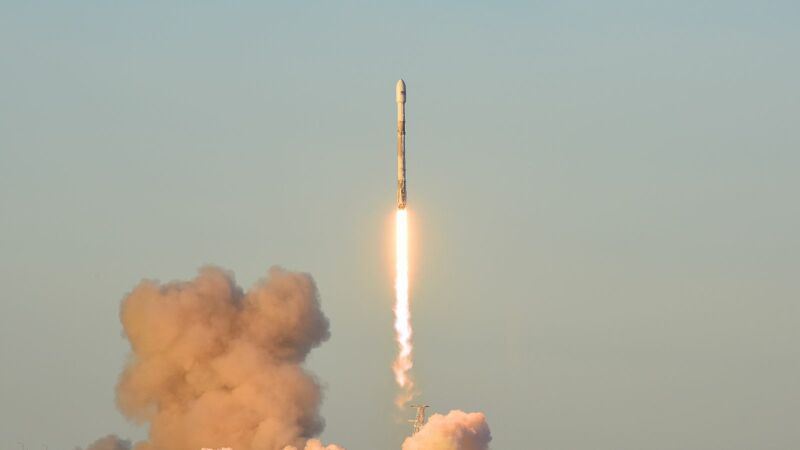 Adding in the historic first launch of the Falcon Heavy in February brings the Hawthorne, California-based company’s launch total to six for the first quarter of 2018. Interestingly, this was also the 30th worldwide launch attempt this year, which is the most at this point in the year in decades. It is possible 2018 could end with the most orbital launches since at least the early 1990s—potentially earlier. The year with the most orbital launch attempts was 1967, which saw 127 successful or partially successful flights place 172 spacecraft into orbit, according to a NASA database. The payload, a total of 10 Iridium NEXT satellites, is part of a large contract with SpaceX to launch a total of 75 satellites into six different orbital planes for Iridium Communications. This was the fifth of the eight flights, which so far have all had 10 satellites on board. The goal is to replace the company’s aging constellation with the next-generation satellites to provide upgraded voice and data services for the company’s one million active subscribers. The first 40 next-generation satellites were launched in groups of 10 last year all on Falcon 9 rockets from VAFB: They occurred in January, June, October, and December 2017 respectively. The Falcon 9 first stage that was used for the Iridium-5 flight, designated as core 1041.2, was the same block 4 booster used for the Iridium-3 launch in October 2017, which placed the third set of 10 satellites into orbit. However, SpaceX did not attempt a recovery of the stage for a second time. Instead, outfitted with landing legs and grid fins, the booster was used to test out experimental landing maneuvers with no drone ship to meet it. This wasn’t the first time that an Iridium Communications satellite launch used a previously-flown booster to orbit its payload. The Iridium-4 flight in December 2017 used core 1036, which was used during the Iridium-2 mission in late June of 2017. 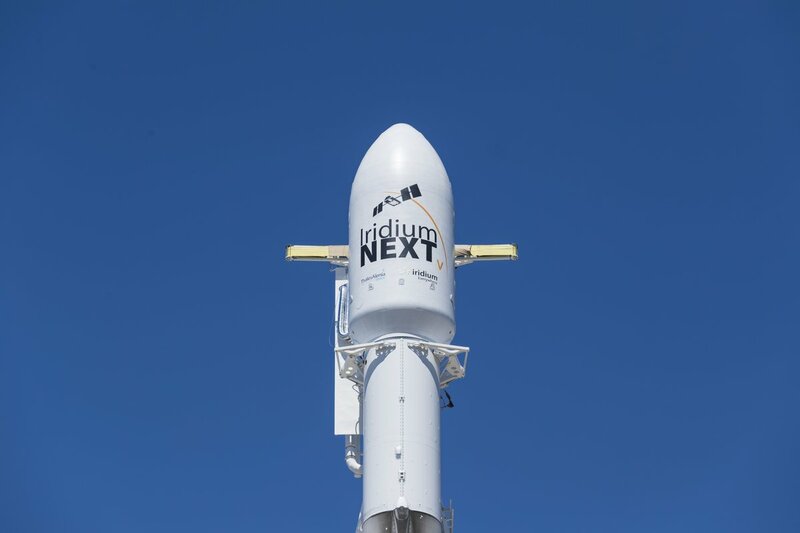 By electing to fly previously flown boosters for the last two flights, Iridium Communications was able to get the launch rate it desired to get its upgraded constellation completely launched by the end of 2018. To date, the five missions have used only three first stage boosters. The next flight for Iridium Communications, which is currently scheduled for mid-May, will only deploy five Iridium NEXT satellites. 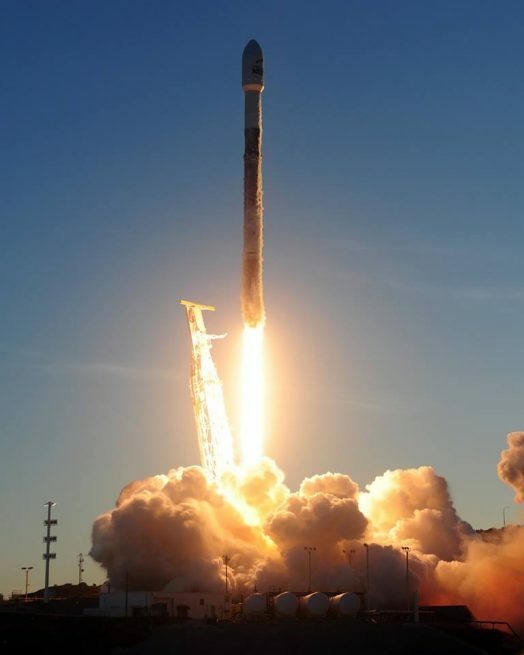 That will leave an additional payload capacity, which SpaceX will utilized to deliver two Gravity Recovery and Climate Experiment Follow-On (GRACE Follow-On) satellites into orbit for NASA and the GFZ German Research Center for Geosciences in Germany. In the lead-up to launch, an issue with one of Iridium NEXT satellites resulted in a one-day delay while iridium addressed the problem. Following a countdown where no significant issues were noted, the nine first stage Merlin 1D engines ignited about three seconds before liftoff, producing 1.7 million pounds (7,600 kilonewtons) of thrust. Once the on-board flight computers confirmed everything was performing nominally, liftoff of the Falcon 9 occurred at 7:13 a.m. PDT (10:13 a.m. EDT / 14:13 GMT). The vehicle passed through the area of maximum dynamic pressure, also known as Max-Q, about 76 seconds into the flight. This was where the vehicle experienced its maximum atmospheric pressure acting against it. To help ensure the rocket remained stable, the engines were throttled back until the vehicle climbed further into even thinner atmosphere before being throttled up to 100 percent. Two minutes, 34 seconds after leaving California, the first stage main engines, having exhausted all of its propellant consisting of liquid oxygen and rocket-grade kerosene, cutoff. Three seconds later, the first stage separated from the second stage. Two seconds after that, the Falcon 9 second stage’s single Merlin 1D Vacuum engine ignited to begin propelling the payload further towards its final orbit. Producing 210,000 pounds (934 kilonewtons) of thrust, it burned for about 6 minutes before shutting down. During its ascent, the payload fairing, which was shielding the satellites from the thicker part of the atmosphere, was jettisoned 3 minutes, 24 seconds into the flight as it was no longer required. SpaceX attempted to recovery one half of the $6 million fairing by catching it via a net extended above a ship, but according to CEO Elon Musk, the GPS guided parafoil twisted resulting in a high impact velocity in the water. Meanwhile, the second stages ascent into orbit continued to go nominally. Interestingly, SpaceX reported before the liftoff that the company would be ending video coverage of the flight at the nine minute mark—seconds before entering a parking orbit—because of a restriction from the National Oceanic and Atmospheric Administration (NOAA). This caused confusion for many watching the launch, including NOAA, which tweeted that it was looking into questions regarding the broadcast interruption of SpaceX’s launch. “We will be in touch when we know more,” the agency tweeted. We are looking into questions on the broadcast interruption of this morning’s @SpaceX launch of #Iridium5. We will be in touch when we know more. Regardless, SpaceX continued to update the status of the mission via its Twitter account. It confirmed the second stage engine cut off on time at about nine minutes, 2 seconds into the flight to begin a 43-minute coast phase. Once at the appropriate spot, the second stage fired for a brief 11 seconds to circularize its orbit at planned 388-mile (625-kilometer) altitude with an inclination of 86 degrees. The Iridium NEXT satellite began deploying beginning at a mission elapsed time of 57 minutes, 16 seconds. The final one was deployed about 15 minutes later, SpaceX confirmed. The successful deployment brings the total number of Iridium Next satellites in orbit to 50. Like the first 40, these satellites will now slowly drift into their final orbital position. Once there, they will undergo activation and testing. When everything checks out, they will take over for the decades-old legacy satellites they are replacing. After the legacy satellites are all replaced, they will be deorbited and allowed to burn up in the Earth’s atmosphere. In fact, that is already beginning to occur with the most recent occurring on March 28, 2018. Correction: The 10 Iridium NEXT satellites were deployed one at a time, not in pairs, as previously reported. This article talks about the satellites being released in pairs. The timeline on https://spaceflightnow.com/2018/03/30/falcon-9-iridium-5-mission-status-center/ shows the spacecraft being released singularly about 2 minutes apart.